ACW’s Vintage High Frame Stripping Guide. The high frame is our standard frame for 11mm guides, i.e., it’s a ‘normal’ height modern frame when used with larger rings. However, when using it to mount the smaller 10mm ring, the wings of the frame are slightly elevated, which creates a beautifully balanced appearance. Approximately 1.200” long and 0.610” tall from the bottom of the feet to the top of the ring. Pre-WWII Rings; modern bezels, modern frames; crafted in-house. 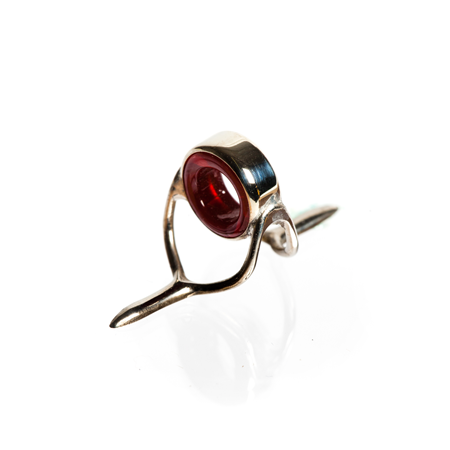 Vintage, Pre-WWII Red Rings 10mm – a mix of agate and agatine, no material choice. Click here for a ramble on stripping guide frame styles! Made in the USA, using our frames, bezels, & labor, with vintage German rings.